Efficient communications are the key to produce smoothly run and well coordinated operations at large events such as the 2010 Winter Games in Vancouver. With a long history in equipping majorscale events such as the Winter Games 2006 in Torino or the Olympic Games 2008 in Beijing, Riedel Communications is predestinated for installing such an infrastructure. The Germanbased manufacturer and rental service provider of intercom, radio, video and audio solutions supplies the entire complement of radio equipment as well as the communications system for VANOC - the organization committee of the Vancouver Games. 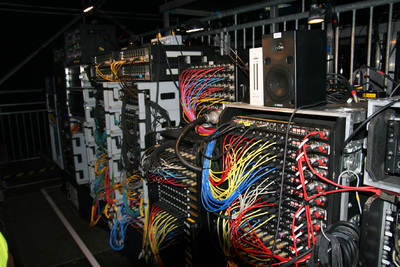 More than 70 Artist digital matrix intercom systems and 10,000 digital radios are used at the Vancouver Games. 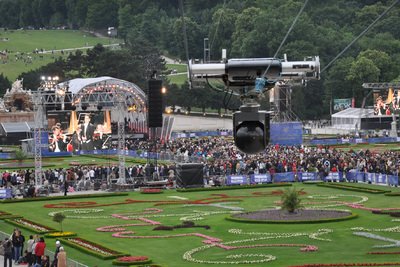 In addition, Riedel, facilitates several wireless video links for the host broadcaster OBS. In addition several international right holding broadcasters such as NRK, BBC and ZDF utilize Riedel's intercom systems. Radio Infrastructure On the behalf of Bell Riedel installed an extensive digital radio network infrastructure with 26 RF sites with over 500 repeater channels and two dispatch consoles covering the whole Vancouver and Whistler region. 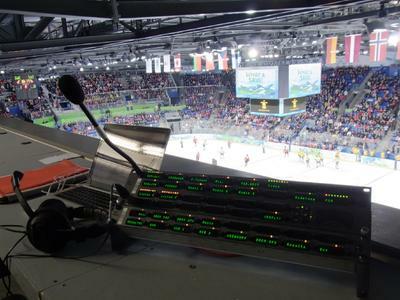 More than 6,500 mobile and installed digital radios with thousands of Riedel AIR, PRO and MAX headsets and additional accessories are used at the Games. Two network management terminals provide intelligent trunked organization of the frequencies and channels. Comprehensive Venue Intercom Although mostly invisible to the audience, one of the most important factors at major scale events is the communications infrastructure. Riedel provides the communications backbone for VANOC consisting of over more than 60 Artist digital intercom matrix systems, which ties the entire configuration together. Referees, time keepers and assistants communicate mainly over 20 digital Performer partyline systems, which are seamlessly integrated into the matrix intercom. A total of more than 500 digital beltpacks are used at the Winter Games. Furthermore more than 2,000 analog mobile radios are used by VANOC to coordinate the Winter Games 2010. Thrilling onsite pictures and information For transmission and distribution of additional video and result content at the venues, the official host broadcaster OBS utilizes 14 venue information systems from Riedel, which were specially developed for this operation. This way journalists, representatives or even visitors could utilize special video receivers provided by OBS to get additional information and video content onsite. To ensure thrilling pictures from the events, Riedel furnished several wireless video links for OBS to realize for instance skycam operations at the Cypress Mountain (Snowboard venue) as well BC Dome the venue for Opening and Closing Ceremonies as well as the nightly Victory Ceremony. International broadcasters Several right holding broadcasters such as the Norwegian NRK, the British BBC or the German ARD/ZDF utilize various Artist digital intercom matrix systems for their communications needs. Comprehensive knowhow with largescale events Riedel Communications has been developing and delivering radio and intercom solutions for largescale events for 23 years. The Company's remarkable tradition reaches from the 1994 Winter Games in Lillehammer to the 2008 Summer Games in Beijing. 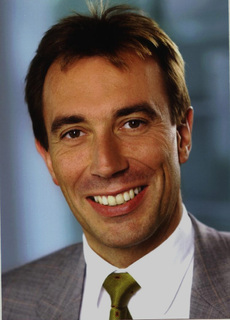 "Thanks to our wide range of experiences we are able to provide communications solutions which meet any demands of largescale event organizers," said Thomas Riedel, Managing Director of Riedel Communications. "Apart from quality and knowhow we are also accomplished in terms of quantity. As one of the largest rental companies for radio and intercom technology worldwide we also have the necessary inventory to equip events of this size." Riedel Communications - the largest supplier of communications equipment to the 2008 Olympic Summer Games in Beijing - designs, manufactures and distributes the most sophisticated intercom, fiber and radio technology for customers worldwide in the broadcast, proaudio, event, sports, theatre and security industries. The products reflect today's leadingedge technologies that expand conventional concepts into tomorrow's applications. The Riedel group of companies also includes a European based large rental operation that provides radio and intercom services, event IT solutions as well as fiberbased and wireless audio & video transmission systems. The Company was founded in 1987 and today employs over 200 people located within 8 locations in Europe, Australia, Asia and North America.